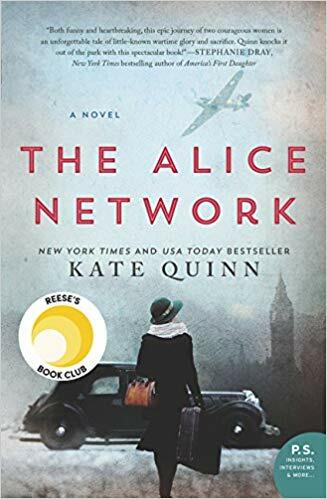 “The Alice Network” by Kate Quinn combines the records of real World War I and World War II historical figures with the stories of plausible fictitious characters to create a captivating narrative. The novel chronicles the lives of Eve and Charlie as they struggle with the losses from two great wars. It is hard to not be engulfed by this book as more is revealed about Eve’s past as an English spy. Charlie’s battle for independence from her parents in a time when women were always required a guardian will have you rooting for her as she gains the gumption to make decisions on her own. Although the book feels slow to start, it is worth sticking around. After a few paragraphs the adventure begins and does not cease until the end of the novel. The characters feel true to life with all of their flaws presented openly to the reader. War and its effects on soldiers and the lives of soldiers’ families is not romanticized, rather it is magnified and given the justice it deserves. Charlie and Eve may be complicated and slightly damaged, but they are never weak. The book switches between characters and time periods, but it is not difficult to follow. One thing Quinn does better than most authors who alternate characters is maintain effortless flow. The transitions never feel choppy or forced, and they add to the suspense created at the end of each chapter. “The Alice Network” is a great read for fans of historical fiction, especially history involving the World Wars. For anyone looking to take a journey in the back of an ex-convict’s Lagonda with a drunken spy and pregnant teen, “The Alice Network” is a perfect fit.